Slow cooker chipotle honey chicken taco salad lunch bowls- a hands off meal prep lunch recipe. The sauce doubles as a dressing for the salad, and you don’t even need to turn on your oven! One year ago at this time, I started a fun little experiment called the Breakfast Prep Challenge. I was scared. I thought no one would join me and I’d be all alone, prepping breakfasts on Facebook Live with no one watching. But you did join. There were over 200 of you that joined me in the first challenge, and we had such a fun time! I was totally energized and wanted to run another challenge almost right away. We had one more Breakfast Prep Challenge in November, and then decided to make the jump to lunches. 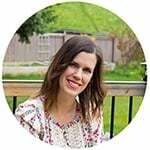 In January 2017, we launched the Lunch Prep Challenge, and to my complete and utter surprise, over 14,000 of you joined us! And now, here we are. One year in, launching our fifth challenge, and there are over 27,000 of you who have signed up. I am over the moon, and so excited to share my meal prep passion with you all! It just goes to show that sometimes the things that scare you are the things worth doing. If you are interested in signing up, leave your e-mail below, and you will get access to free recipes, shopping lists, video prep tutorials and an awesome Facebook community where we cheer each other on! Today’s slow cooker chipotle honey chicken taco salad lunch bowls (oh my gosh what a MOUTHFUL that title is!! 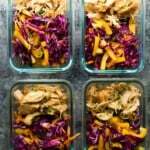 ), is not one of the recipes in our challenge, but it is definitely a good one to start with if you are new to meal prep! 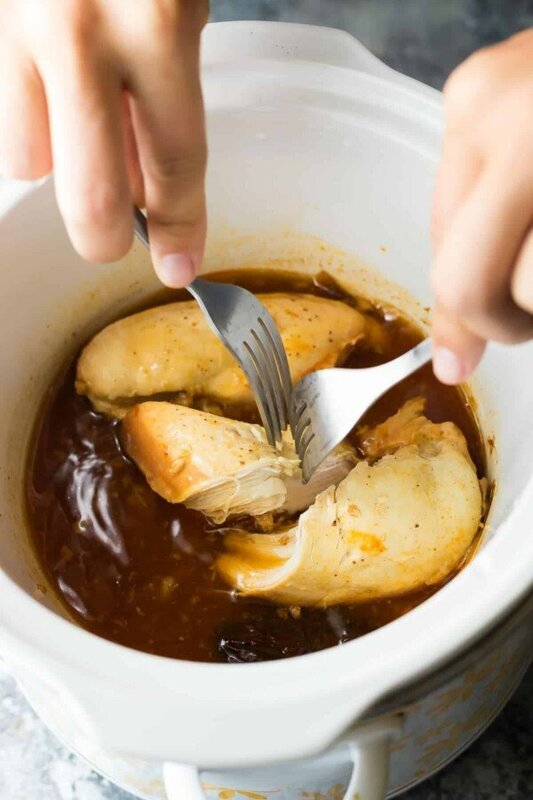 Prepping the chicken in the slow cooker makes it such a hands off recipe, with the bonus being that you don’t need to turn on the oven! 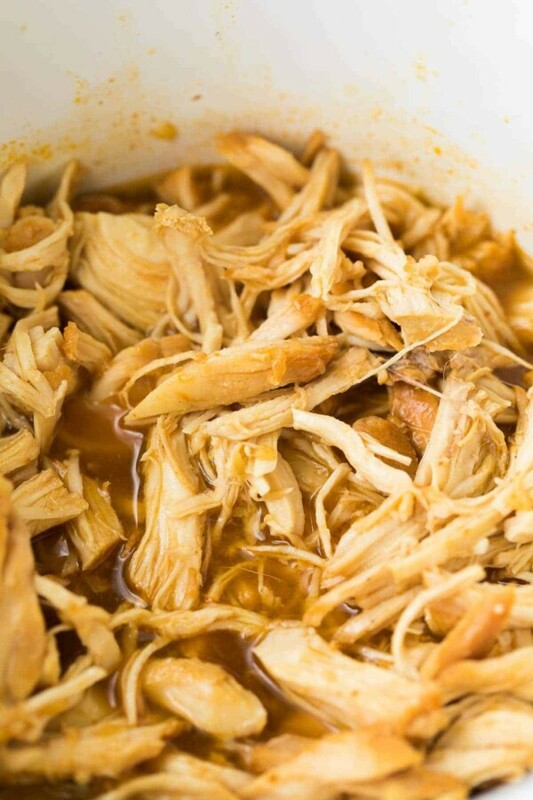 To prep the slow cooker chipotle honey chicken, you can use either boneless skinless chicken breasts or chicken thighs. The thighs will hold up better over the week but they are also a bit higher in fat. Toss them in a super simple cooking sauce of stock, honey, adobo sauce (and a chipotle pepper if you’re feeling adventurous! ), salt, garlic and lime juice. 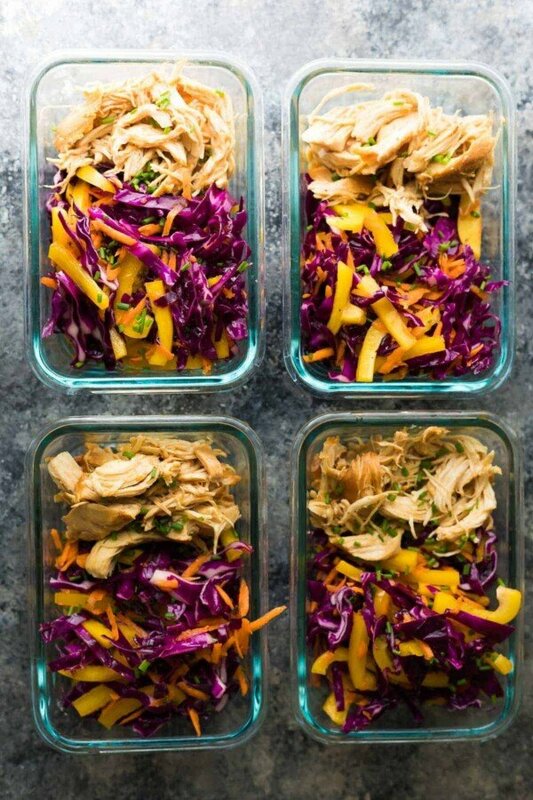 Cook ’em up, shred ’em, and portion ’em out into 2 cup storage containers. 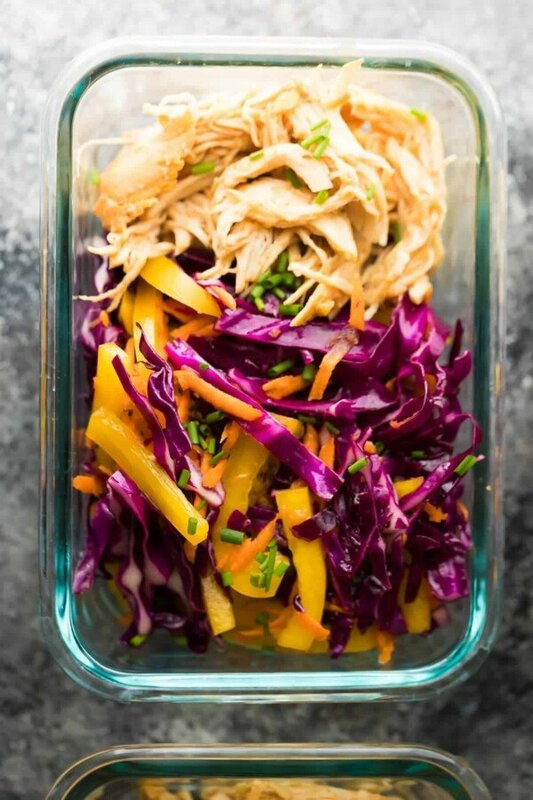 Don’t forget to spoon some of the sauce over the chicken because it doubles as the vinaigrette when you go to serve this salad! ?! They are RIDICULOUSLY expensive on Amazon.ca (4x more than in the US?!) but I’m eyeing them up and waiting for a price reduction. 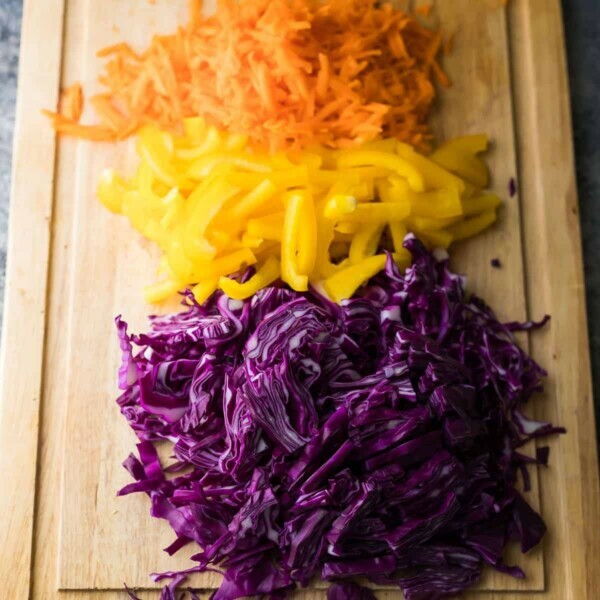 They would be perfect for this recipe to keep your cabbage nice and crunchy. You’re definitely going to want to keep your tortilla strips separate to keep them crunchy…bringing the bag to work is a good idea or you could portion them out into small containers. To serve this chicken taco salad: heat chicken. Or don’t heat the chicken. It’s up to you. 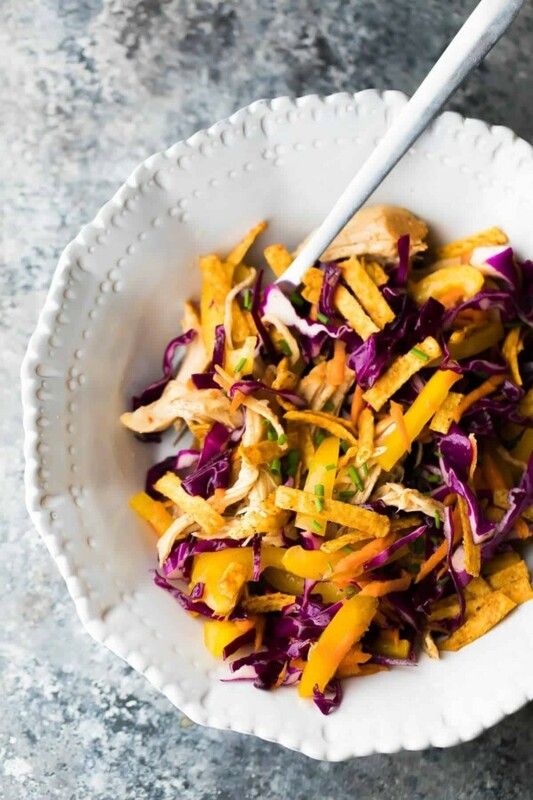 Toss everything up, and if you can toss in some fresh crunchy tortilla strips, you certainly won’t regret it. Enjoy your sweet, smoky, spicy and crunchy lunch! , which is great to cook small batches like this recipe. You could double the recipe and use a larger slow cooker. This chicken freezes well! Slow cooker chipotle honey chicken taco salad lunch bowls- a hands off meal prep lunch recipe. The sauce doubles as a dressing for the salad, and you don't even need to turn on your oven! Slow Cooker Chipotle Honey ChickenCombine the chicken, stock, honey, salt, garlic, lime juice, adobo sauce and chipotle pepper in the base of a 2.5 quart slow cooker (see note). Cook on low 4-5 hrs or high 3-4 hours. Do not over-cook this recipe as the honey may cause it to burn. Taco Salad Lunch BowlsPrep the veggies and divide between four 2-cup capacity storage containers (2-compartment containers recommended if you have them). Portion out the chicken in the containers and spoon the sauce over. Keep tortilla strips or tortillas separate until just before serving. StorageSeal and store in the fridge for up to 4 days. To serveHeat the chicken or serve cold. Mix everything up, tossing the sauce over the salad. Sprinkle with tortilla strips or serve in a tortilla (taco-style). Recipe may be doubled and cooked in a 5 quart slow cooker; if you have too much chicken, it can be frozen for up to 3 months. Doubled the recipe and made these on the weekend. I don’t as worried I would still be hungry after I ate it, but it was very filling and fueled me for my workout! Glad I found your intagram page! I just wanted to let you know that I found divided glass dishes at Walmart here in Canada that are almost the same as the Amazon.ca ones but way cheaper! Thanks for all of your wonderful dishes! Congrats on your new baby!!!!! Awesome! I will have to see if I can find some of these. Thanks, Erin! This looks delicious (and so does the honey lime chicken!) – a great, healthy lunch option that looks pretty easy too! Can you make this in an instant pot? If so what is the cook time? Hi Beth, that’s a great question! I’m not actually sure as I’ve not cooked this recipe in my Instant Pot yet. Here’s a great post with a bunch of different chicken breast Instant Pot recipes, it looks like she cooks high pressure 12 minutes with quick pressure release. I’ve never tried it though!